According to the 2014 November Current Population Survey, North Carolina had just over 7.4 million individuals of voting-age (18+). Of these, nearly 6.9 million or 92.5% were citizens, meaning they were eligible to vote. This is slightly higher than the national share of voting-eligible adults (91.7%). Across the states, the proportion of voting-eligible adults ranges from 84.2% in California to 99.4% in West Virginia. North Carolina has the 16th highest share of non-citizen adults. In North Carolina, both citizen registration rates and citizen voting rates were above the national average in the November 2014 election. Among the 6.9 million voting-eligible adults, nearly 4.8 million or 70% were registered to vote in 2014. Nationally, just under 65% of adult citizens were registered to vote. 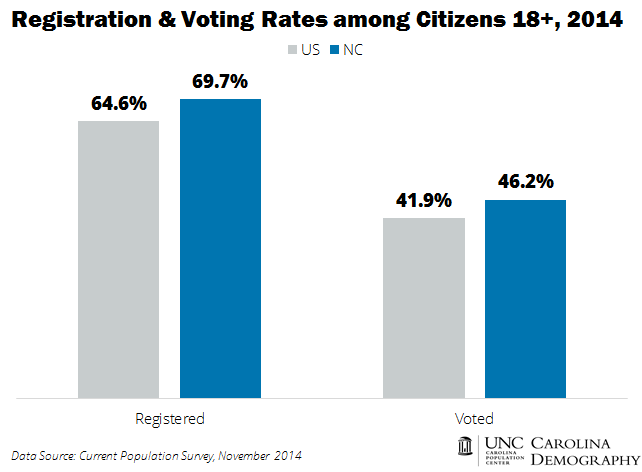 North Carolina had the 13th highest rate of citizen voter registration among the states. Maine had the highest registration rates (76.5%) while Hawaii reported the lowest rates (51.3%). Only about two of every three North Carolina registered voters (66.3%) showed up to vote on Election Day, however. In total, fewer than half (46%) of North Carolina’s adult citizens cast a ballot in November 2014. This is higher than the national average (42%) but the 20th highest turnout among the states. Maine had the highest share of citizen voting (62%). It was the only state where more than 60% of citizens voted in the 2014 congressional election. This reflected both its high registration rates and relatively high turnout among registered voters (80%). In contrast, only one in every three West Virginia citizens cast a ballot in the 2014 November election. This reflected a combination of below average citizen registration rates (62%) and low turnout: only 54% of registered voters showed up at the polls on Election Day. This entry was posted in Elections & Voting and tagged 2014, citizen, congressional election, turnout, voting rates, voting registration. Bookmark the permalink.